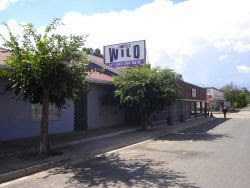 On Friday on our journey back from Port Elizabeth we stayed overnight at The Wild Hotel in Venterstad. It's a small detour from the main PE-Bloemfontein route, and well worth it. Driving north from PE, you take the R390 from Cradock, through Hofmeyr and Steynsburg, and then turn right into Venterstad. It's a long, empty tar road with wonderful views and almost no traffic. It was a pleasure to drive, compared with the trucks and slow vehicles on the N10. When we arrived we felt like we'd stepped back in time a few decades, to the kind of hotel your aunt would run: everything feels like home. It's unpretentious and tastefully decorated, with comfortable rooms, a proper bath with piping hot water, and excellent meals. It even has a small reading library and a piano. There is a public bar with a pool table and slot machines. When we arrived on Friday night there was a wedding reception in full swing next door, but our rooms were well away from the party and there was no disturbance at all. Christi Vorster the owner gave us personal attention and cooked the meals for us. My Lamb Chops were cooked to perfection, and everyone enjoyed their meal. The following day we had breakfast and Christi gave us some tips on the best route to follow past the Gariep Dam and then on to Bloemfontein. The place has the privacy and facilities of a hotel, with the personal charm and service of a B&B, and the whole experience added a pleasant chapter to the journey home. We will certainly recommend the place to our friends. I have also just returned from a weekend in Venterstad. What a coincidence! Maybe you even drove past my house? The owners of the Wild Hotel are great - so friendly and ready to help with anything. I also recommend a visit to the hotel, the town and the area.